hightouchmegastore: Crying at the movies: a memoir. I cried at the end of Bridesmaids when the rich lady who is co-opting the whole wedding reveals that she's just lonely and needs approval. I resented this movie for making me do that. Just for the record: Into the West is one of my favorite movies ever. Also, did you happen to hear this episode of This American Life? Act 4 has a guy talking about crying on airplanes, which totally cracked me up. Honestly, how can it be a good movie if it leaves me with dry eyes? Except movies like Elephant Man which are so hugely heroically tragic that I can't cry but just stand there witnessing (standing inwardly even if seated). I cry a lot, which is a problem. Especially in public! So when I feel the tears start to well up, I focus on a random word (such as "lozenge") and say it over and over in my head as a diversionary tactic. Thinking about sports, however, might be more fun. I sometimes watched "The Way We Were" in order to cry. I also cried at "Our Idiot Brother" with the final dog scene. C'mon. A dog!! 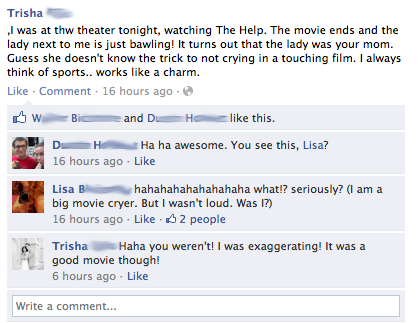 I cry at movies a lot, sometimes because I am mad at the movie for making me cry.